More than 13,000 people have been caught speeding on the M4 around Newport since enforcement was introduced six months ago. 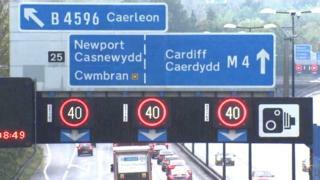 The variable speed limit covers the stretch from junction 24 (Coldra) to junction 28 (Tredegar Park). An average of 84 motorists a day were caught breaking the limit between September and the end of February. The system was introduced in 2011 but was inactive for five years - fines have only been issued since 10 October. Prosecutions can be handed out whatever the variable limit is - from 20mph (32km/h) to 70mph (112km/h). A Welsh Government spokesman said: "Although still relatively early days in terms of measuring the success of the system, it's encouraging that compliance with the speed limits continues to improve, enabling the system to work as intended." Chris Hume, partnership manager at GoSafe, which manages the cameras, said the number of drivers caught speeding was a "very small percentage" of the number of vehicles passing through the area.